Almost complete. The faint lines are where the remaining outside buffer stripes will go. 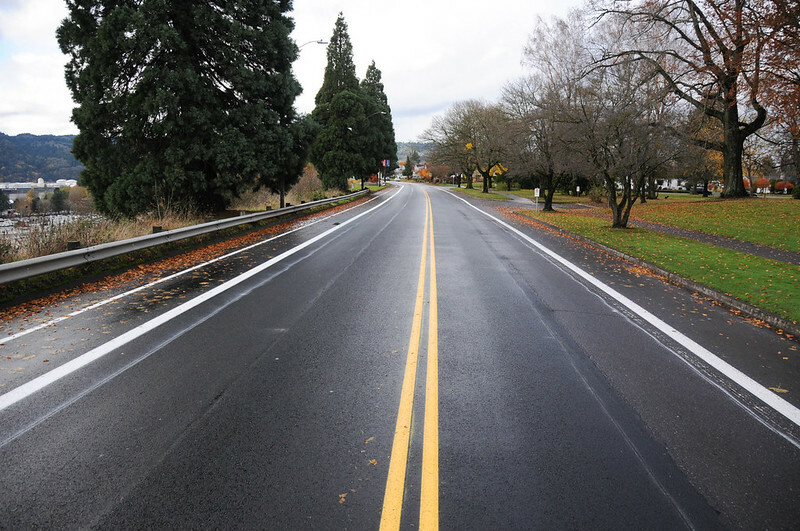 The Portland Bureau of Transportation is nearly done with their Willamette Blvd restriping project. 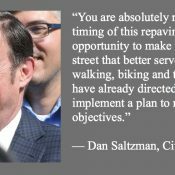 This is the street where neighborhood residents seized an opportunity to improve the bikeway, galvanized tons of support, and got PBOT commissioner Dan Saltzman to back them up. The result is a redesigned cross-section between Rosa Parks and Woolsey (Columbia Park) that has shifted the centerline to the north, no longer allows on-street parking, has buffered bike lanes in both directions, and has a much wider bikeway in the southbound direction. The new striping was planned for completion last week but rain has pushed things back a bit. As of this morning, it appears to be finished except for the outer buffer stripe on the southbound bike lane and on some portions of the northbound one. Both sides of the street feel very different for bicycle riders. In the northbound direction, you no longer have that cushion of space that used to be used for on-street auto parking. The nice thing about the old design was that the parking lane was rarely used and offered lots of extra space to ride in. The new bike lane is curb-tight. It will feel much better when the buffer strip goes in (and would feel even better if it had some physical protection, but I digress). While I miss the extra space offered in the old design when no parked cars were present, I like the predictability of having no parking and would rather ride next to a curb than a parked car any day of the week. So far, PBOT has only done one bicycle symbol each block (if that) and I didn’t notice any special “no parking” signs or markings. I seriously hope there’s more signage/markings and enforcement/education when the project is completed. Here’s why: I’ve seen two people parked in the bike lane so far. When they do, there’s zero extra room to get by because the bike lane is only 6.5-feet wide (with a 1.5-foot buffer). 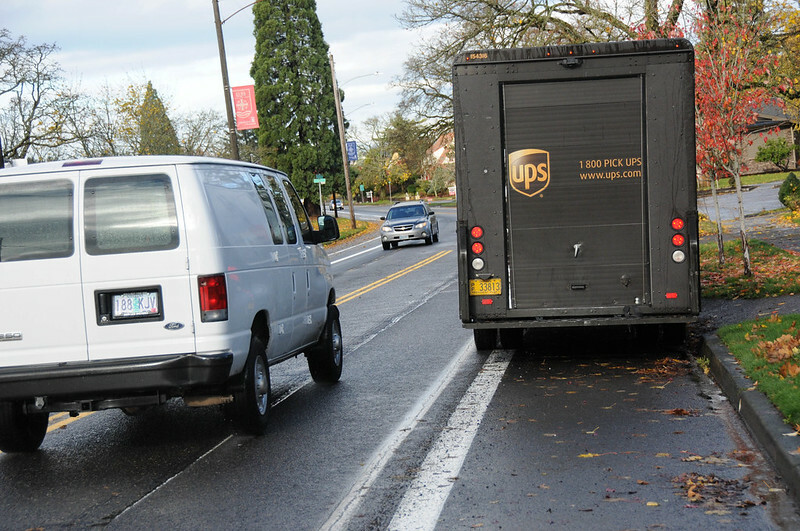 I saw a UPS driver parked in the bike lane for several minutes. And a woman attending a function at a church also parked in the new bike lane. The woman could barely get out of her car with other drivers flying by at around 30 mph. There’s only one standard lane going northbound, so drivers can’t swerve over too much or they’ll slam into oncoming traffic. PBOT needs more signage and/or markings to make sure people don’t do this. No car parking, but being right up against the curb with motor vehicles so close isn’t exactly low-stress. As always, you still have to keep your eyes peeled for people turning right. Another shift has to do with cross-traffic. In the past when people wanted drive onto Willamette from a side street, they could peek out into traffic and only encroach into the lane used for parking. This gave them several feet before entering the bike lane. Now with the bike lane curbside, people have to make sure they stop well short of the intersection — making it hard to see oncoming traffic — or they’ll block the bike lane. People will have wait and look before turning intoI watched traffic lanes without encroaching into the bike lane. Speaking of blocking the bike lane. Peak hours are bonkers on Willamette. It has become such a thoroughfare and people really drive dangerously. This morning I saw someone trying to turn left onto Woolsey from Willamette and instead of waiting behind them, two drivers swerved into the southbound bike lane to go around (photo below). This is another reason having some sort of physical protection is so important. We cannot have people thinking bike lanes are for anything other than cycling. Ever. So selfish, rude, and dangerous. Two cars swerve into the bike lane instead of waiting a few seconds for someone to turn left from Willamette to Woolsey. Can you believe it? Riding side-by-side in comfort on Willamette. Oh what a relief! With 12 feet of space to use, the new southbound bikeway is a huge improvement over the claustraphobic and stressful design of old. And once the outside buffer line is striped, it will feel even better. Also, if not for this extra space, people would be riding through piles of leaves and big puddles right now. Leaves and puddles are still a huge problem here. PBOT needs to clean this up. Being able to breathe easily on the bluff side of Willamette is a great feeling. Another thing I noticed is that now bicycle users have a passing lane. 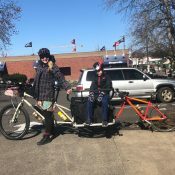 With Willamette being a popular connection to training and recreational rides in the West Hills (and beyond), this is an important benefit. In the past it was dicey to pass a slower rider. I’d have to triple-check my shoulder, watch for potholes, and enter into auto traffic going 30+ mph. Now I just slow down a bit, ding my bell, smile, and get by without much fuss. She was able to pass me without leaving the bike lane. Overall, I’m very happy to see these changes and I’m impressed that PBOT made such quick work of it. The fact that they decided to prioritize mobility over free auto parking without much public process at all is nothing short of extraordinary. However, the street is still more stressful than it should be. With only paint as protection from motor vehicle users, ever-increasing auto volumes, and a speed limit of 30 mph (lowered recently from 35, but still deadly), I don’t think we’ll be seeing a lot of young people and families riding here. That might change if/when PBOT comes back and adds some type of physical barrier in the new buffer zones. We’ll see. Have you ridden Willamette lately? What have you seen? What do you think of the new striping. Thanks for the coverage and detailing what many of us experience daily with photos and words. Our accounts don’t always resonate in the comments. 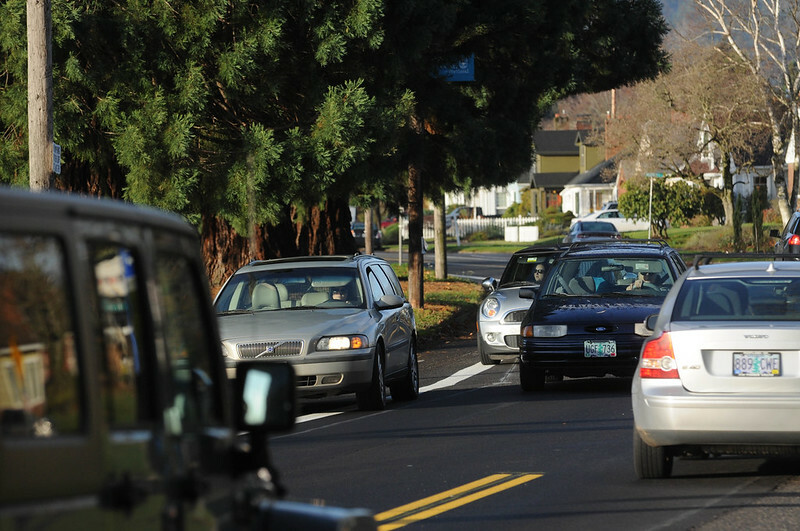 Unlike many close-in primary bike routes, Willamette’s growing volumes don’t appear to be nearing a congestion situation that actually slows traffic. Opportunities to pass illegally on the right keep drivers flowing. The pedestrian signal at UP and Portsmouth traffic light clear in one cycle (the latter thanks to passing on the right). Willamette is a very inviting option for drivers aiming to avoid congestion and will remain so for some time without changes. The street is a recipe for regular disaster if PBOT doesn’t get in front of the volumes, calming, and do something about the passing and haste at which many drivers feel they must enter and exit the street. I’ll admit my family rarely drives via Lombard because Willamette is more pleasant. But our vote would be a 25 mph Willamette and we would still always favor Willamette over Lombard if posted 15 mph. Just no rush. There really needs to be some outreach with congregants of the church. It seems the only time I’ve ever seen cars in the N bound bike lane it’s always right by the church (and quite often Washington plates). Increasing the density of bike symbols and/or adding “no parking” signs is definitely a good idea too. Seems kinda universal. Lots of places where I ride, it’s always the churches where bike lanes get parked out. To be fair, though, signage isn’t always consistent (in one frequent offender, there is a bike lane sign on a pole, but no street letters or symbols anywhere nearby, and I think people are more used to seeing the bike lane markings than a small sign easily mistaken for weekday street sweeping regulations). Just print out leaflets to put on their windshields. Use recycled paper. I think it’s better than a sticker. Sure, a sticker on the window has a certain type of impact, but it also makes us cyclists kind of look like a do***eb*gs. Yes, you are correct. Thanks for the idea. It didn’t come across in my message, but I really only use stickers for the egregious, not the ignorant (whom I just ignore and signal and take the lane). Putting a sticker on a car could also be considered illegal. I’m going to start going in and asking folks to move. Bad situation there last night for me. Maybe reach out to the Minister to consult his/her congregation. Be diplomatic about the process. one can travel on Willamette from Richmond in the town center to N Rosa Parks Blvd, nearly 4 miles with only one traffic signal at Portsmouth and the ped crossing light at U of P . This encourages Willamette as a high speed route. there are several streets, notably Willis ,Chataqua and Bryant that might merit a signal that would encourage legal safe turns and calm traffic. Signals don’t calm traffic, and they attract people that drive. That’s because they don’t incorporate speed radar which automatically turns them red for people approaching too fast. …and attracts vulnerable pedestrians too. in this area, there is no parallel backstreets to take between Willamette and Lombard, owing to columbia park and odd sized blocks. I think a roundabout at Chautauqua woukd be far better than a stoplight intersection. Keep everyone flowing, allow left turns onto willamette without getting T-boned or running down a pedestrian. The views from Willamette BLVD are so amazing. Too bad this couldn’t go the same course as the old high way that used to exist where waterfront park is. I used to ride this every day to and from my old house. Does it make me a monster to say I don’t understand what was wrong with it before? I never had any uncomfortable interactions with cars on that street. What they really should have done was get rid of the spots that gather water and freeze over. I had at least two interactions with frozen puddles. I agree. I’ve never felt uncomfortable riding here. But admittedly, I don’t ride on N. Willamette as frequently as others do. Jonathon, I anxiously await the same article on Initial impressions of new striping on Barbur Blvd that has been completed now for a month or so. I’d be happy to do the article myself, but would love to have someone along with photography skills! Maybe a weekend ride (hint, hint). In the case of Barbur the cycling conditions have improved slightly as a result. ODOT should be commended at least for making an effort and using more green paint than I’ve seen them use in the past. That’s exciting to hear. Used to ride it a lot but not anymore. What’d they do to it? Is this the Capitol Hwy junction area that was in the works? It is important to note that a modicum of bollards at intersections where turns (thus conflict) occur most frequently would significantly add to safety on this route. Why does PBOT keep building new bike lanes that don’t comply with NACTO (or their own) guidelines? The speed limit is 30mph here, and traffic counts on Willamette in Feb gave an ADT of 5929 westbound and 5880 eastbound. In my neighborhood (Sellwood), PBOT is currently installing unprotected bike lanes on a similar road – speeds above 30mph, ADT above 6000. In our case they did at least post a lower speed limit. SW Main is another example of failing to meet these guidelines, albeit a totally different scenario (a paving project on a major bike route). I know a lot of great and dedicated people at PBOT are working hard to make protected bike lanes a reality, but we keep building new projects that are obsolete the day they go in. As an advocate, I’m unsure whether we should be supportive that new projects are going in or we should oppose projects that fail to meet these guidelines. Thanks for the clarification, William! Now I understand your comment! 🙂 Cheers! 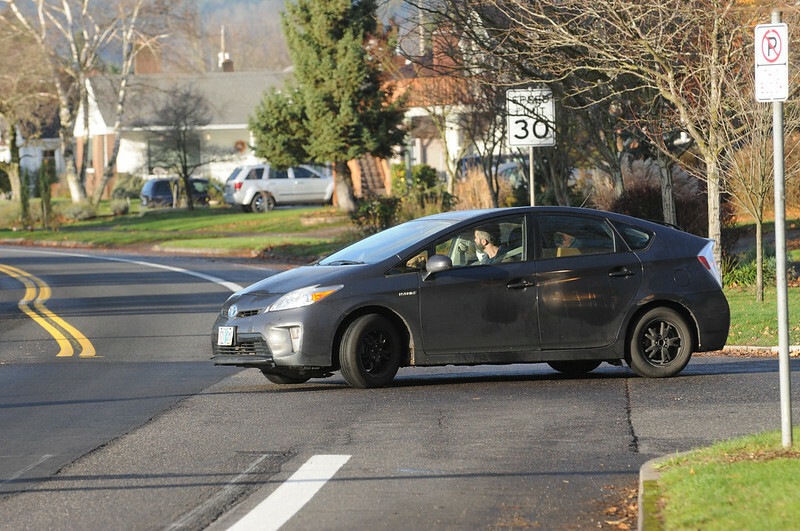 With the law going into effect on January 1, 2018 PBOT needs to be willing and ready to aggressively lower speed limits in the City limits. 20 is plenty. If Vision Zero is the goal and enforcement is non-existent/impossible then this is the best way for the driving public to police themselves with the presumable majority driving at or near the limit in order to obey the laws. Thus a decline in roadway injuries and fatalities. Everything you say makes sense, but there’s still the issue that protected bike lanes are expensive. 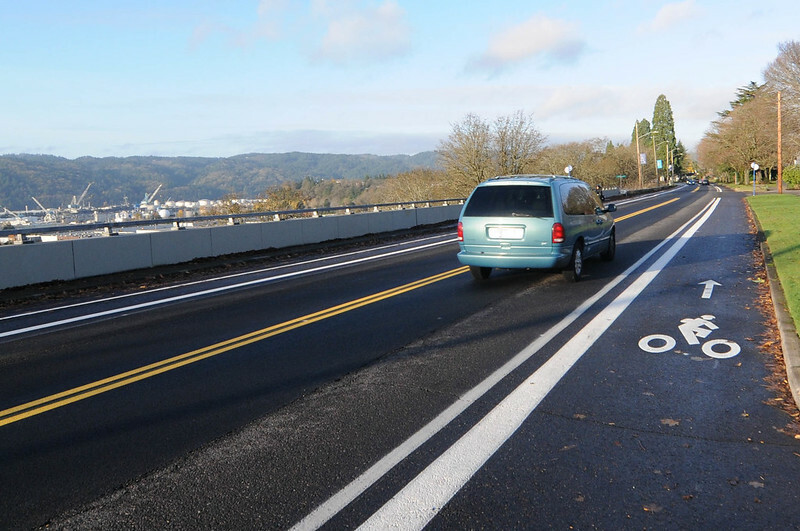 The “protected bike lanes by default” was always “subject to funding availability.” This Willamette Blvd re-striping was an opportunistic low-cost project jumping on a paving project. 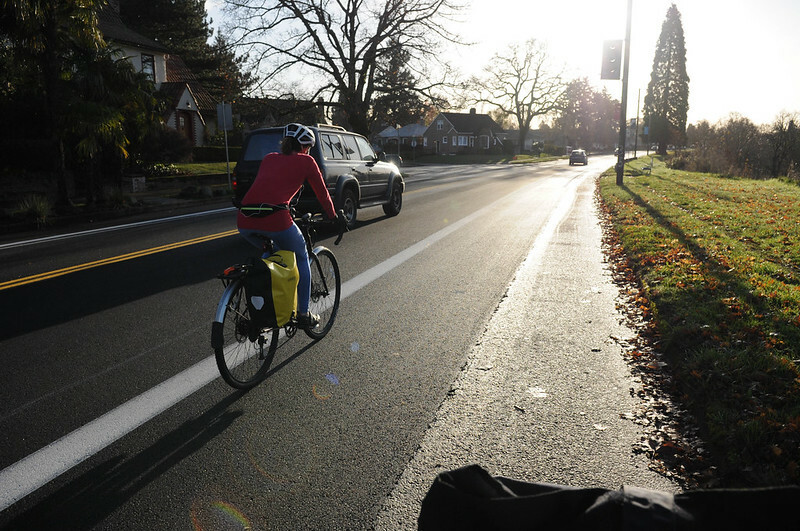 PBOT will need to identify millions of dollars to upgrade it to a real protected bike lane. NACTO guidelines are great, but until NACTO starts giving out multi-million dollar grants, you can’t expect them to always be implemented. 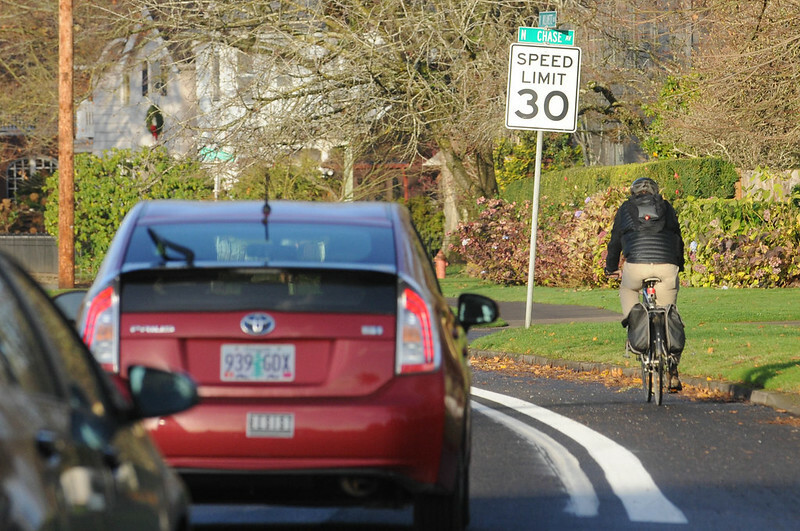 The NACTO guidelines call for protection when speeds are above a certain threshold. 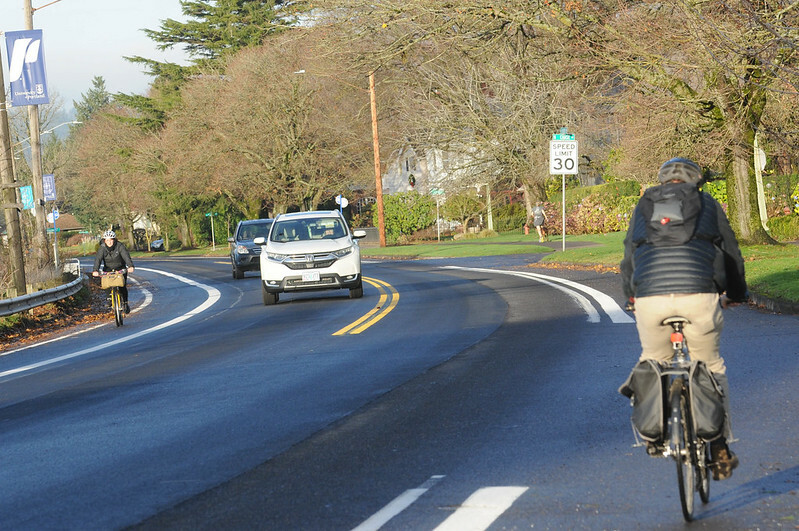 This means that PBOT could comply in two ways: by adding protection or by lowering real speeds. If we can’t afford protection, we ought to be able to afford a speed limit reduction. Great comment William. Thank you. I have some of the very same feelings myself. One thing though, on the “protected bike lanes by default” thing. That’s not really as strong of a policy as it was made out to be. It’s really only a suggestion and it only comes into play with a new commercial development. I’m glad Leah Treat put it out there, but — like a lot of things PBOT says and wishes for — I wish it had more teeth. Southbound is a huge improvement! Your points on Northbound are good ones though. 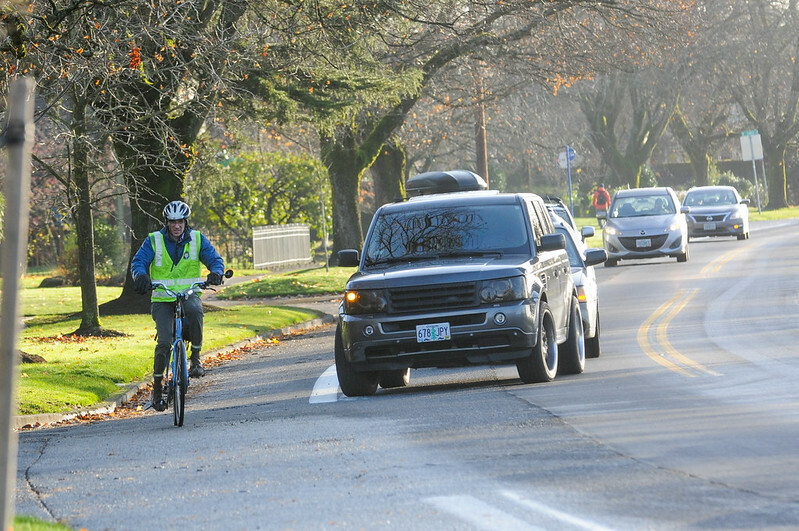 I feel people “temporarily” parking cars and delivery vehicles will push the limits of legality in that Northbound bike lane… Imagine the next time one of those homes on Willamette Blvd holds a garage sale and people start showing up. Well have to see, but I expect enforcement to be equivalent to what we’ve seen a short distance away at New Seasons on Lombard. lacking. Regardless amazing effort by PBOT to move this effort forward the way the have. IMO, it’s a good sign for us all. Have fun! Perhaps PBOT could start with physical separation for 100-200 foot sections opposite side streets to prevent the illegal passing. Would go very far in improving the experience without needing a contiguous seperator. Also at the intersections where drivers nudge out, I’d suggest a full green paint treatment if the bike land and “stop behind line” signage. Wouldn’t stop the nudging but would make it much clearer to them of their state of infraction when, ahem, pointed out by helpful cyclists and pedestrians. Goes without saying that no parking signage is needed stat. “…treatment in the bike lane”. Darn mobile typing. The irony here is that PBOT made exactly the same “suggestion” to ODOT, when ODOT did similar striping along outer Powell a couple years ago. Yes, Willamette is pleasant compared to outer Powell during off peak hours, but the same dangerous “passing on the right” mentality. The city is full of different bikeway designs, and will continue to piece together a network working toward an “opportunity for everyone” active transportation system. I’m the optimist. Driver education has to be part of the vision. I’d like to see some leadership at the highest level. Some political fortitude! When I last rode WIlamette a few weeks ago before this much of the restriping was done, I noticed that old stripes had been ground off. Grinding to remove paint creates some potentially very dangerous pavement for riding; was this ameliorated or addressed in any way by the new striping? Also, why was it decided that the south side bike lane should be so much wider than the north side? Why didn’t they split the difference of the extra space between both lanes to create something which feels roomier and safer for both sides of the street? Overall, these improvements are slightly better than the previous configuration for the cost of the paint, but certainly nothing groundbreaking. 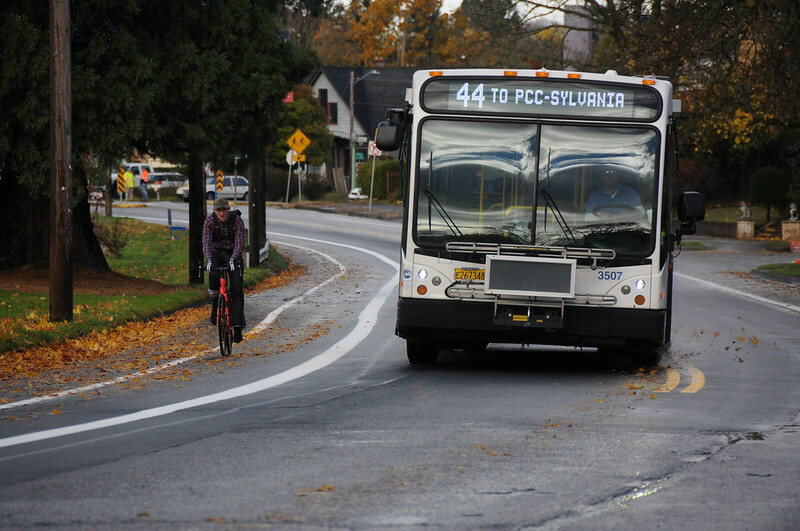 It would really be great if PBOT could spend some more effort creating NEW bike infrastructure and closing gaps, e.g., where the bike lane ends on WIlamette before reaching N Richmond Ave.
South side is wider to allow pedestrians to get to the Line 44 bus stops. The south side lane was made wider to add pedestrian accommodations and the need for better access to transit on that side of the street. A similar thing was done a few years ago on Barbur across the street from what is now the Under Armour facility. I hugely dislike the grinder and have been advocating against its use for years. I thought this was all new pavement, why did they even need to use the grinder at all? They did apply a liberal grinding layer to create the new lane alignments, and I rode over it in night time conditions – it is quite rough in some spots, and wanders through the new bike lane, frequently. It’s not that bad, but irksome. They re-paved only the center sections of this roadway. This is the entire car travel lanes between the old alignment of the bike lanes. They did not touch the outer sections of the roadway, including any space covered by the old bike lanes. This was done in a pretty slick, seamless way, as Jonathan had pointed out in an earlier article. This practice captures about 80% of the failed pavement for repair in the heaviest used car travel lanes, but it does leave the cyclist wondering why they are treated like a second class citizen, having to deal with the degraded bike lane and getting no new pavement while cars get all smooth new blacktop. But, then they shifted the bike lanes over, from one gutter to the other after the paving project, and that moved the bluff-side bike lane space to be on top of the new pavement. So, that’s a bonus for the new lane alignment on one side of the road. But, then they ground down some paint on it…. The new lane striping is great, and long overdue. I’ve been cycling this route regularly since 2007 and recently moved to University Park from St Johns. Now that I’m driving this route to/from daily, I’m noticing now there are a bunch of drivers who use the buffered bike lane to pass cars waiting to turn left,when traveling south. Hoping this practice doesn’t lead to bicycle riders being crushed against the kerb or guard rail. 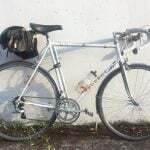 So in the ten years you’ve been riding this, how many cyclists have been ‘crushed against the kerbs or guard rails?’ Please don’t make people fearful when there is no need to do so! But by all means, wear two helments if you think it’s necessary! I worry about this every time I ride it, and I see people using it as a passing lane daily. Compared to what was there for cyclists before this seems pretty generous to me, and some of Jonathan’s quibbles seem pretty minor. You couldn’t pay me to ride a bicycle on the road shown in most of those pictures. I’d do it for free. 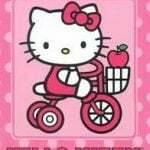 It’s a good ride to bike on! I was thinking, “Wow, it’s like paradise up there now!”. The picture with the driver turning right, with a signal on, patiently waiting for the cyclist to proceed… holy crap what I’d give for that here! Jonathan, this strikes me as a bit histrionic; I have no problem with car drivers doing this provided they don’t endanger or violate the right of way of cyclists in the bike lane. 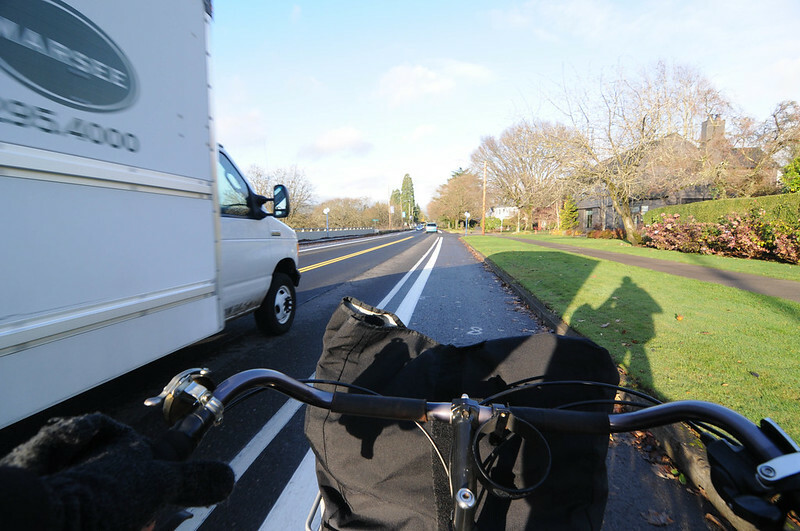 A quick mirror/blind spot check, and everyone can stay safe and keep moving–just like when we use the auto lane to pass a slower cyclist in the bike lane. let’s have motorists pass each other on the shoulder on the highway too, Or use the middle turn lane as a passing lane also, what could go wrong? I agree if done carefully (come to stop, or nearly, check path, proceed) it doesn’t bother me. I think the issue is it breeds complacency. People stop being careful about it because they get so comfortable with it. Scooching into the bike lane while driving a car, looking at Waze, checking that text msg etc., is extremeley dangerous and it is specifically against the law. But it is the daily reality. Here, and/or on east Powell Blvd, some baby in a stroller is going to be killed because of these illegal incursions. The price of doing business? What if you’re also drunk? Or maybe just high? We cyclists should be cautious about being overly pedantic with what’s legal and what’s not. Rolling stop signs, while often completely safe, is illegal. Wearing earbuds, not riding as far to the right as possible, etc etc. My point was not that we should bow to the mighty automobile and relegate our right of way. BUT, cyclists pointing out illegal acts by drivers when there is no danger or impact to other road users is no more helpful than motorists doing the same about cyclist behavior. Bikeninja’s comment about highways and middle lanes is more histrionics (and false equivalency). Gary’s point about complacency is a good one, and well taken. You stated what I was going to. If you’re going to throw the lawbook around, you better be above reproah. I don’t understand the cars peeking out into traffic. If there’s no parking, why would they need to peek out? There’s nothing to obstruct the view of traffic, they’re simply creeping forward–needlessly–to get a jump on their turn. First off, really excited that we’ve reclaimed parking space for active transportation. However, I still have some criticisms. First, I find the walking lane on the south side baffling. I rode it during striping and can’t imagine riding closer to cars when I could be further from cars. And I can’t imagine that walking it would feel comfortable. PBOT has a speed policy, informed by Vision Zero, that requires either low speeds or separation when vulnerable users are present. This doesn’t appear to violate the letter of the policy, but IMO the presence of an unbuffered and unprotected bike lane on a 30mph street is a violation of the spirit of the policy. It is a 30 MPH limit. What are you trying to say? The street is signed at 30. And people have a 40% chance of dying when they’re hit by a car going 30 mph. In my opinion this is too fast for an unprotected bike lane. “Protected bike lanes by default” is subject to funding availability. Come on, people. It should be fairly obvious that things cost money. the city spends half a billion dollars on public safety. perhaps our budget priorities are completely out of whack. great story thanks for all the hard work and attention. Yes Ed you are correct. I like to think there is room for passing, but if people on foot are present they have the right-of-way. Kind of like the way cars dip into the bike lane to pass, right? Fine if there is room, but if cyclists are present, respect their right-of-way? The difference is that one is allowed by law, and one is not. To me, the legal situation is secondary. The more important issues are safety and, on some level, respect towards other road users. When I’m on foot, I find cyclists dipping into my space disconcerting. Perhaps others don’t. 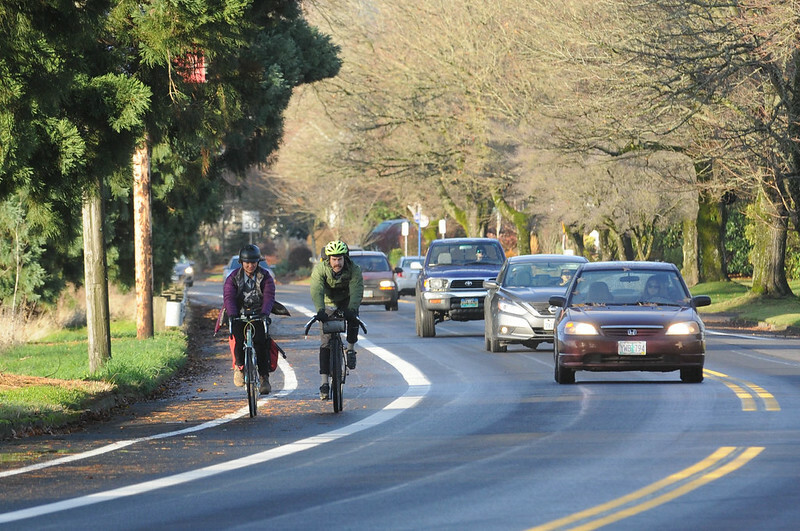 Driving on bike lanes to cut around any traffic is illegal in Oregon. cutting into a bike lane decreases travel time? can you please explain this to me. Is this true? What protection by the law are offered to people walking down the roadway? It seems that history has shown that when anyone is struck while standing or walking in the road (except at crosswalks) it is typically ruled an accident, unless it is hit and run or DUI. 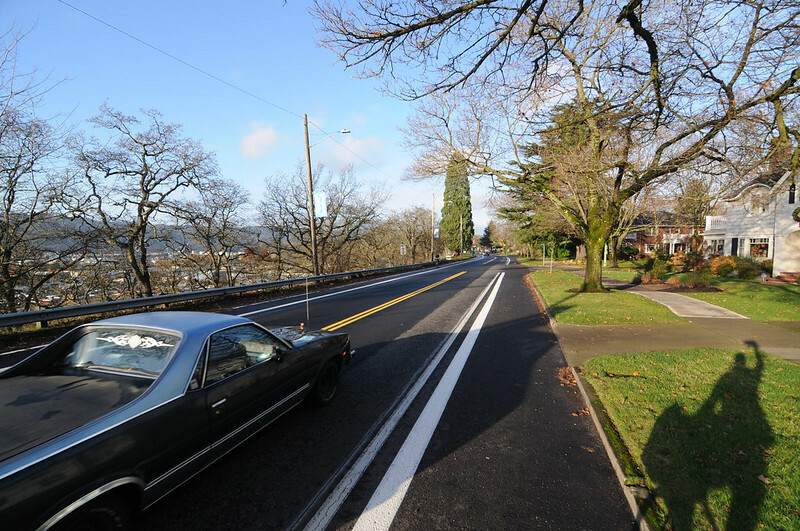 Isn’t this new paint stripe creating a new lane between the curb and the bike lane that PBOT has put on the roadway completely ambiguous as to legal status? 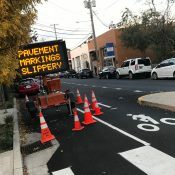 This just seems to me like it’s inline with PBOT’s plan to add lots of unclear painting to roadways, without any clear ORS legal backing or specific signage to help everyone understand what to expect. I’m not a big fan of the pedestrian lane on grade with auto traffic. For half of the year, it’s basically a leaf and puddle lane. And be careful on the sections with guardrail when temps get into low 30’s; the pedestrian lane in these sections is shielded from the low winter sun and can create a very slippery surface. For training rides, Willamette has always been great. It’s direct, no stops, relatively smooth, and fast. You can do a full set of intervals without interruption. But you’d better cover your brakes, in case a car turns left across you, without signalling. I think the traffic coming off and onto side streets could mostly be solved with “right turn only” signs and medians. Couple that with a large, 20mph roundabout at Chautauqua, and you have a route that works for car traffic, is safe for novice cyclists, and not boring/slow for athletes out training. I do really like the new lanes, though. No more fear of being doored by a parked car. I think the lack of worry about being doored is a huge improvement. At this point, I have no complaints. Willamette is a tame kitten compared to most of my commuting. Spend some time riding Cornell at night and during AM rush hour and you’ll discover just how nice those low speed roads with bike lanes are. For the moment I have 3 big dreams for infrastructure improvements. Fix the horrendous potholes on EB Cornell between Thompsons & 53rd. Get a streetlight or 2 on Cornell between Miller and Skyline (it’s hard to see driving in a car, much less riding a bike at night). And get a foot or two of shoulder pavement at the gravel lots on WB Cornell below the Audubon. All small easy things that somehow just never happen. Not much respect for the westside, I agree. Great coverage Johnathan. Can’t wait to check it out one of these says when its not super cold and raining. As for the cross street car traffic entering Willamette…did PBoT not add stop bars and dashed bike lanes? That’s not typically done on low-traffic local streets, only on busy streets. In some states (on the west coast?) a stop bar is painted at every single stop sign, in every single city in the state. It’s like a state law or something. Plus, they paint the word “STOP” on the roadway at every single stop sign. I know, that’s crazy thinking. 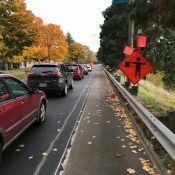 These changes were made without notice to those of us who live on this stretch of N Willamette! How fair is this? And yes we support bicyclists! The REAL issue on Willamette is the number of cars and the high speed limit! Seems like 25 mpg would be safer for pedestrians, cyclists and residents trying to exit and enter driveways! I’m sorry you don’t feel you received adequate notice. Although you happen to own property abutting, it is just as much our road as it is yours. We appreciate any inconvenience you may endure so that I can travel a bit more safely. 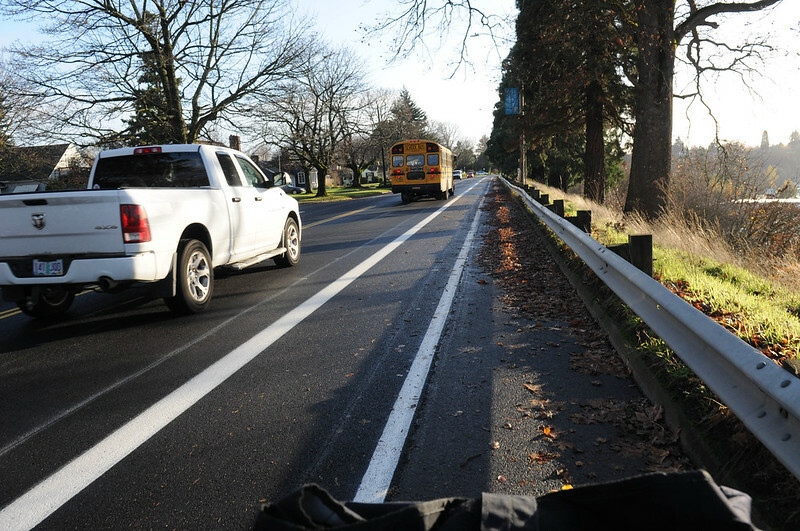 PBOT could add plastic wands on the line separating the bike lane from the traffic lane in some key locations, like ahead of intersections (to deter drivers from using the bike lane to pass left-turning cars) and in front of places where drivers tend to illegally park. Also, more pavement markings with “NO PARKING” and “BIKE LANE” and more “NO PARKING ANY TIME” signs. I’m sure this has been asked before, but if you put in physical separation (bollards?) between bike lane and car lane, how do you clean it? The time demands for such cleaning is enormous, and will never get done. Over here in Bend, whenever any kind of narrow barrier is put in, it does not get swept. There are little median cuts in my neighborhood that have not been swept in ten years and have 4″ of debris in them. In theory the city would use its bike lane-sized sweeper. In practice it’s been ¯\_(ツ)_/¯ but improving? Anecdotally, this year seems to have fewer trash troughs, but I’m also riding somewhat less, especially so on that training wheels infra. Perhaps we (the cycling community) can organize an Adopt-A-Lane to crowd-source the clearing of the worst trash/leaf piles from key bike lanes. I imagine that many of us already sweep any bike lanes in front of our houses. I keep the one in front of me clear of (most) leaves. But an organized effort would work better. In a perfect world the city’s bike lane sweeper would do it . . . but I have never seen that sweeper in action, or any signs that it has been in action. I dunno, i noticed that the bike lane heading south from Broadway down toward the Moda Center was swept over the past weekend. Before that there was a nice bike-wheel sized path in the middle of all the leaves that was fine for me, but might have made less confident riders nervous about slippage. This week, no leaves! The sweeper fairy must have visited. But yeah, I think people should at the very least adopt storm drains near their home for keeping clear. That would be such a help to this city! I too sweep the bike lane in front of my property several times in the year. It’s not a policy solution but it keeps part of Portland’s main streets clear for a section of it. Impression: from one gutter to the other. Now the debris and leaves have a little more room to accumulate undisturbed on the bluff side. The extra elbow room on the bluff side is nice, as is the new pavement surface on that side. The gutter bike lane on the residential side now has more issues with puddles and debris accumulation than it did when it was out from the curb. Additional conflicts with cars who have nosed out into the intersection trying to make a turn onto Willamette from the neighborhood have gotten worse, as have right hooks. So, the residential side is worse than before, but now just typical of city-wide treatments. On the bluff side, right-side passing by cars using the bike lane to go around left turning cars will be more of a dangerous problem than the old alignment. The shifting of the gutter lane with no wands has enabled this. It remains to be seen if bike traffic will be impeded by new users of the bluff side lane – joggers, peds walking in the road, etc. This new treatment was only run out for half the distance of this stretch of road, so now there is a weird dogleg jog at Woolsey where you go back to the old alignment. POBT should have gone all-in, instead of half-baked. So, two steps forward, one step back. A little better if you are inbound, a little worse if you are outbound. I still think the most dangerous places on this road are north of the cut at IDA street, where the bike lanes disappear; and south of IDA where the bike lane gets compressed through winding corners a few times; and lastly, at the entrance to UP (where there is a ghost bike, RIP), with the half-baked right turn/merge lane on the college side, and the crappy routing of bike lane through here on the inbound side, along with a lot of cars doing a lot of different things right here, not to mention bus stop conflicts and failed pavement. Maybe city will deal with the real issues to bike safety on this road sometime in the next 10 years. I think perhaps the biggest gain here is that the political hurdle of removing the parking is cleared–at the lowest possible cost and fastest possible means. Now, it’s a whole lot easier to have discussions about how it can be better. 2-way path on the bluff side with bollards? Sure, now it’s just an marginal cost a few years down the road. If PBOT is going to start converting parking lanes into bike lanes, they need to do pavement and drainage upgrades at the same time. This is now a problem in multiple places, and it’s the reason I won’t use the curb lanes downtown on SW 2nd and 3rd. What’s the problem there? Puddles? Both water accumulation and pavement condition. Fine tuning is needing but I must first say that I had to fight back tears from eyes on this vast improvement. I used to bike this route daily for a year and understand all too well the concerns others have already brought up during the design process. Thank you, PBOT! Now, let’s fine tune and make those small improvements that guarantee safely and predictable traffic flow for all modes of transportation. I don’t understand the center lane loading zone hate. When I see a truck loading from the center lane, I see it as acting as a form of traffic calming, adding a bit of chaos to the street that slows traffic. Ditto and trucks do have to load and unload from somewhere. Would we rather they block the bike lane? No, they can’t drive around until they find a legal parking space three blocks away. Yes, there could be designated loading zones curbside but that puts them closer to the bike lane than if they use the center lane. I too enjoy the trucks unloading from the center lane. It narrows the width of the usable roadway which is one of the strongest contributors to speeding and it adds that element of urban chaos that further encourages slower speeds. Plus, the driver is being thoughtful of not blocking a travel lane (which is one of my biggest irks with others who unload in the restricted travel lanes aka bike lanes), having an exit plan that does not involve driving down the narrow, residential sidestreets of Hawthorne, and there’s the aforementioned benefit of slowing down traffic on Hawthorne. I was very pleasantly surprised on my way into work Friday morning. All but TWO residents on this entire stretch of Willamette Blvd had the courtesy to put their recycling and garbage cans on the grass at TOP OF CURB rather than on the pavement below which is now Bike lane. For this, I say THANK YOU!!! This is my first time on this website, stumbled upon it somehow, so allow me to share my first impression… The comment below a photo where the author stated, “So selfish, rude, and dangerous. Two cars swerve into the bike lane instead of waiting a few seconds for someone to turn left from Willamette to Woolsey” is beyond my comprehension. There are no bikes present, who cares if a car uses the bike lane? If there are no cars or bikes present, can a person use the street to skateboard or play basketball, hell yes. If there are no cars present, can a bike use the street to do whatever, hell yes. If there are no bikes in the lane, its just pavement to me, just like its pavement to skateboard on or play hackysack on. Use it man.